Do you search comprehensive but free Integrated Development Environment tool for the PHP development? Take a look at the NetBeans project. I use it about two years and very satisfied how it works for me. Use the navigator window or the Go To Type, Go To File, Go To Symbol, Go To Declaration, Find Usages menu items for easy code navigation in large projects. The editor warns about potential code problems by flagging them and giving an hint in a pop-up. A tasks window lists all warnings in the project, making it easy to find and resolve problems. Benefit from syntactic and semantic code highlighting, pop-up documentation, code formating and folding, mark occurrences and exit points, and code templates for PHP files. The NetBeans PHP editor offers code generation (Getters and Setters), refactoring (Instant Rename), parameter tooltips, hints and quick fixes (Implement All Abstract Methods), and smart code completion (including bracket completion). The PHP editor parses variable type definitions in comments which improves code completion and hyperlink navigation. PHP projects can easily be deployed from within NetBeans IDE for testing to local or remote servers via FTP or SFTP, or by the use of an upload script for more complex deployments. Run the project as a local web site, as a command line script or as a remote web application via FTP or SFTP. Debug PHP code using Xdebug: You can inspect local variables, set watches, set breakpoints, and evaluate code live. Navigate to declarations, types and files using Go To shortcuts and hypertext links. Use a global PHP include path for all projects or customize it per project. The NetBeans IDE for PHP also offers command-line debugging: The PHP program output appears in a command line display in the IDE itself and you can inspect the generated HTML without having to switch to a browser. You can debug scripts and web pages, either locally or remotely. The NetBeans PHP debugger integration allows you to map server paths to local paths to enable remote debugging. PHP developers can also look forward to working with MySQL. The Insert Code command provides a Database Table option that creates the code needed to execute a SELECT statement in MySQL. Open a window to make changes to MySQL tables, select individual table cells with the mouse, and edit them directly. 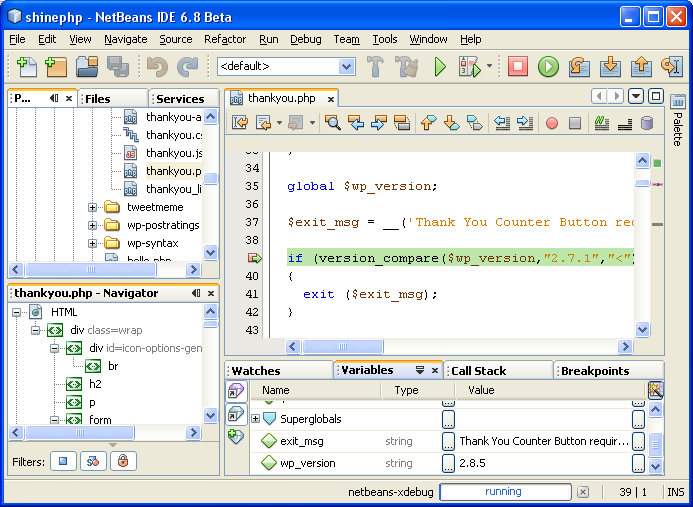 NetBeans has a built-in support for the most popular version control systems: Subversion, CVS, Mercurial. I recommend: try NetBeans IDE. File size for PHP package is 25Mb only. You can download your free copy from http://www.netbeans.org/downloads/index.html. PHP developers do not need to install the full Java Development Kit (JDK) to run the NetBeans PHP IDE, the standard Java Runtime Environment (JRE) is sufficient. And the last but not least news: NetBeans IDE 6.8 is Available for Download!. PHP support has been extended to include the Symfony framework and PHP 5.3. 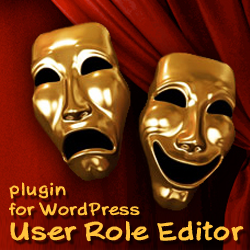 This entry was posted on Sunday, October 25th, 2009 at 06:36	and is filed under NetBeans, PHP. You can follow any responses to this entry through the RSS 2.0 feed. You can skip to the end and leave a response. Pinging is currently not allowed.